The Glenlea Long-Term Rotation Study is teaching us valuable lessons about organic crop management as well as the ecology of the system. Learn more in the video produced for our 25th anniversary. This long-term, large-scale study was established in 1992 and is completing its 25th year in 2016. The Glenlea study contains many different crop production systems, including western Canada's oldest organic cropping systems. 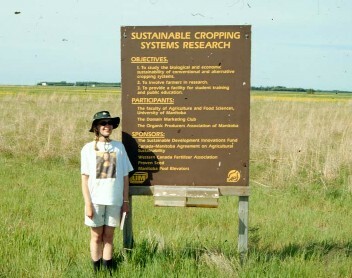 This study is unique in that each replicate contains a one acre restored prairie grass planting, which serves as a benchmark site for soil and environmental measurements. The Glenlea long-term rotation study is located 20 km south of Winnipeg, Canada (Lat/Long. N 49,39,0 / W 97,7,0). The soil type is a rego Black Chernozem consisting of 12% sand, 32% silt, 55% clay, with an organic matter content of 5.5%. Annual precipitation is 535 mm with approximately 30% of annual precipitation as snow. The average frost-free period is 120 days and the growing degree days (>5 C) is 1755. The study was established in 1992 and has since undergone several modifications. Experimental design is a split plot randomized complete block with three replicates (See Plot Plan 1). Main plots are composed of the crop rotation treatments and measure approximately 90 × 60 m. Subplots consist of four combinations of crop inputs and measure approximately 45 × 30 m. Each block also contains a restored prairie treatment (45 × 60 m). Three 4-year crop rotations were included in the study. Flax served as a &quot;test crop&quot; in the 4th year of each rotation to allow for rotation comparisons. Flax was chosen because it is not a very competitive crop and the rotational effects on weed populations should be evident. The crop input treatments consisted of four combinations of herbicide and fertilizer inputs. Herbicide applications were based on economic thresholds and fertilizer applications were based on annual soil tests. The prairie contains a mixture of cool and warm season grasses typical of the tallgrass prairie that once dominated southern Manitoba. Species include: big bluestem, indian grass, switchgrass, western wheatgrass, northern wheatgrass and slender wheatgrass. The prairie has been managed twice with a prescribed burn; once in 1995 and again in 1997. For results from the first twelve years, visit Glenlea Long-Term Rotation: Historical Research Results. The Glenlea Study underwent major modifications in 2004. The current experimental design is a randomized complete block with 3 replicates. Two main rotation types are included in the study; a grain only rotation, and grain-forage rotation. Plots were split and the rotation was fully phases, meaning that all rotation crops appear in the rotation each year. These two rotations are conducted under both organic and conventional methods. The soybean crop in the organic grain only rotation is substituted with a mixture of annual legumes which are green manured. In addition to the cropping systems, the study continues to include a native grass planting (1, 1-acre grass prairie in each of the 3 replicates). This page imported Nov 2012 from the former Glenlea Long-term Study website.